This is the maintenance portion of the plan, in which followers are allowed to eat whatever they like without regaining weight – provided that they follow 3 unbreakable rules including eating only unlimited lean protein one set day per week. 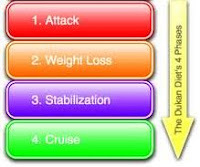 Exercise is considered an essential component of The Dukan Diet and is non-negotiable. Dieters must walk briskly for twenty minutes each day in phase one and this is increased to thirty minutes a day in phase two. The author believes fast results are the key to weight-loss motivation. His high-protein, low-calorie plan is divided into four phases. The first two phases are geared toward helping readers shed pounds quickly, while the second two are designed to maintain weight loss permanently. The Attack Phase: The goal of this phase is dramatic weight loss of four to 10 pounds in seven days or less. During this phase, readers eat a pure protein diet consisting of unlimited amounts of lean protein supplemented by 1½ tablespoons of oat bran. In addition to lean meat, fish, shellfish, skinless poultry (with the exception of goose and duck), eggs, tofu, seitan and nonfat dairy products are also allowed. The Cruise Phase: Readers alternate pure protein days with days of pure protein and non-starchy vegetables until they reach their “true” or goal weight. During this phase, readers can expect to initially shed three to four pounds a week. As weight loss slows, they can expect to lose about two pounds a week. The Consolidation Phase: Once readers achieve their goal weight, they transition to the maintenance phase of the plan. The first part of this phase is the Consolidation Phase, targeted at preventing rebound weight gain. This phase lasts for five days for every one pound lost. Readers can eat unlimited amounts of protein and non-starchy vegetables and can also reintroduce limited amounts of fresh fruit, whole-wheat bread and cheese. They can also enjoy two weekly servings of starchy foods, such as pasta, beans or potatoes. To balance the newfound freedom of this phase, readers must follow the pure protein diet from the Attack Phase for one day a week. Eat a pure protein diet one day a week. Always take the stairs instead of elevators or escalators. Eat tablespoons of oat bran daily.